Mass Maharaja Ravi Teja for the first time in his career is playing triple roles in the film titled Amar Akbar Anthony taking shape in the direction of Srinu Vytla. Ravi Teja has revealed the first look posters of the film, that sure increases expectations. 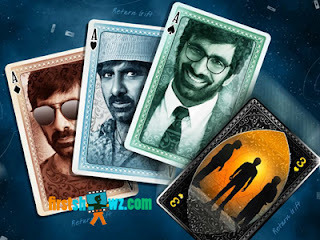 Ravi Teja plays the title roles as Amar Akbar and Anthony with three different get ups on a pack of three Aces with a gambling theme to it, leaving us to guess the roles in the movie. Ileana plays lead lady in this romantic comedy. Produced by Naveen Yerneni, Y. Ravi Shankar, Mohan Cherukuri and Praveen Marpuri on the banners of Mythri Movie Makers, Amar Akbar Anthony has Thaman's musical scores. The film is scheduled for a release on October 5th, 2018 on the occasion of Vijayadasami.